Oh, National Book Award, you are breaking my heart! When the longlist of National Book Award finalists was announced a few weeks ago, I was struck first and foremost by the lack of diversity on the list. Okay, so there's one book by two African-American authors, there's one book about a gay kid, and beyond that it's White, White, White, White, White, White, White, White, and White. I'm not trying to take away from these books. I appreciated the atmospheric weirdness of Bone Gap and am looking forward to Steve Sheinkin's biography of Daniel Ellsberg, which I hear is amazing. I always enjoy a good M. T. Anderson, and am interested in seeing not one but two first novels represented on the list, so I will definitely take a closer look at those. And I will no doubt be reading the others, just to keep up with current events. Walk the Earth a Stranger, for example, has been heavily criticized for its treatment of Native peoples on Debbie Reese's blog, American Indians in Children's Literature. I feel obliged to give it a read. But what I really want to be thinking and talking about instead is All-American Boys by Jason Reynolds and Brandon Kiely and Shadowshaper by Daniel José Older and Everything Everything by Nicola Yoon. These are the books everyone is buzzing about. Why are none of them on the long list? The National Book Award works differently from most other awards in the children's and young adult literature world. Publishers have to nominate titles for consideration, and there is a submission fee of $135 for each book submitted. That really limits the number of books any one publisher can afford to submit, and it also closes out many smaller publishers who can't afford to shell out the money for a submission, not to mention what they would have to pay should a book become a finalist. In that case, they would have to pay $3,000 into a promotional campaign and pay for their authors to attend the ceremony. The chairperson of each judging panel may request a book be submitted for consideration, but with these, the publisher must still agree to all of the above payments. So I wonder: were books by authors of color even submitted by their publishers? If not submitted, were they requested? Or were they submitted and ruled not worthy of being on the longlist? There's no way of knowing, really, although G. Neri, a judge on this year's panel, may have offered some hints in when he revealed his Top 25 favorites that didn't make the list. His extended list is only a little bit more diverse -- he includes a handful of books by authors of color. But even so, his is still a pretty White list, especially if you add in the ten finalists. Last year the diversity represented in the NBA shortlist was thought to be so notable that I was asked to blog about it. 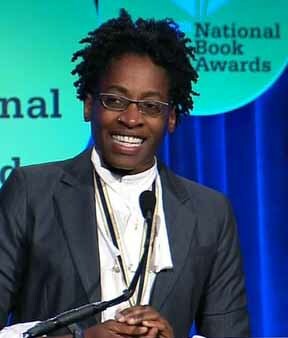 I didn't actually find it quite as unusual as the people over at The Conversation did, given that most of the books were still by White authors, but the end result was that Jacqueline Woodson won the award for Brown Girl Dreaming, a shining moment that was tainted by the racist joke Master of Ceremonies Daniel Handler made right after she accepted the award. Jackie wrote a beautiful opinion piece on this for the New York Times, called "The Pain of the Watermelon Joke." Brown Girl Dreaming went on to win the Coretta Scott King Award, a Newbery Honor, and a Sibert Honor. Now it's almost a year later. Are we any wiser? I'm not sure we are if this letter to the editor at Horn Book is any indication. Do our books -- and book awards -- reflect any more diversity? I don't think so. I'm not saying that I think an author of color should win the National Book Award every year. But I do think they should have at least a few more places at the table, especially when they are writing such excellent books as All-American Boys, Shadowshaper, and Everything, Everything. What would it take to get them there? Tomorrow we'll learn the names of the five finalists in each category. I'm not sure I can muster up a whole lot of enthusiasm. Chances are, I'll be busy reading The Green Bicycle by Haifaa Al Monsour. My bookstore just emailed to let me know they have it on hold for me. I can't wait to read it. I swear I saw an entirely different list, but I guess I was looking at a different longlist...maybe BGHB? Oh! Kirkus Prize.I can see how an entry fee can ask people to be more serious about what they think a book's chances are and to not overtax the judges, but that further fee is astonishing and reeks of privilege and oppression. Then again, NBF is known for not caring much about the marginalized for the past ten years since someone in particular became in charge of things. REVOLUTION has Indians who "moved" to Oklahoma. PICTURE ME GONE has "Indian squaw." And this year, Carson's.... grave robbing Indians. I was glad to see MY NAME IS NOT EASY on there in 2011. Thanks for all that info, KT. I didn't know about all the fees. Thanks for the link to the review, Kate (and the spoiler warning!). EVERYTHING EVERYTHING is on top of my reading pile right now -- I've been eager to read it since it was #1 on the NYT Best Sellers list a few weeks ago, which is pretty amazing for a debut novel by an African-American author. And NBA hasn't had the best track record when it comes to books about characters with disabilities. Everything, Everything is a packaged book. Do you think those should be eligible for awards when an author of color is hired to write a story developed by others (generally white)? It was one of the books NBA paelist Greg Neri included on his list of Top 25 Nominees, so it must have been considered eligible. My impression was that Everything Everything was conceived and written by its author. Can you point us to information about its packaging? I, too, noticed that EVERYTHING, EVERYTHING was a packaged book. Alloy Media, the same company that did SISTERHOOD OF THE TRAVELING PANTS, is listed as co-copyright holder. Thanks for that clarification. I had no idea. So, not to derail the conversation surrounding the NBAs, but is this a common thing, the packaged book? I had no idea either, Monica. And Jonathan, are you saying the same was true for the Traveling Pants series? Weird. Here's a question, maybe for K T, maybe for anyone: when the NBA judges ask for a book to be submitted, do publishers ever decline? Let's say I'm from a publishing company and I have Jacqueline Woodson's book ready to send in to the NBA judges, but they ask for another book; could the publisher decline that book and yet still send the unsolicited Woodson book? Sorry if this is confusing, I'm just trying to wrap my head around the whole process. Yes, publishers can and do decline. My sense is that once the publishers submit then the judges can see what's missing and request. I don't think a publisher would have one book ready to submit and change their mind based on a request--unless it was a small press that didn't have the budget. I just saw the "should" in your comment, Zetta. I read the article about packaging that Kate B. supplied the link for below (thanks, Kate B!) but I still don't feel I know enough about the creative process involved with contemporary packagers, and I think that might have an impact on how I feel about award eligibility. What does "conceptualize" mean here, and how much creative freedom does the author have? I know, for example, that writers of Hardy Boys, Nancy Drew, Bobbsey Twins, and other books in the Stratemeyer Syndicate were given stock characters and outlines to work with, and they were basically fleshing out the outlines with very little to no creative freedom. they got paid a flat fee and didn't get credit for their work. Most didn't want credit, either. For example, Upton Sinclair used to write for the Stratemeyer Syndicate, but he didn't publicize that. He just wanted to pay his rent. One question I have is that if a packaged book won the National Book Award, who would get the $10,000 prize money? Thanks, Lyn. The cynic in me wonders how often an author of color has been on the short end of that situation. And Kate B., thank you for that link; mind blown. I share your concerns about the whiteness of this list, especially when so many fabulous diverse books are available. I do want to point out, only because you mention Simon vs. the Homo Sapiens Agenda as "a book about a gay kid," that Nimona is arguably also about a gay couple. Nimona herself isn't part of that relationship, but Ballister is as major a character as Nimona - a sort of co-protagonist - and he is gay. So the book is diverse in that way, and valuable in that it features a positive, no-big-deal portrayal of a gay relationship. Totally with you in general -- but I just want to say that if you decide not to read Most Dangerous because it's on the Even Whiter Shortlist, you will be missing a remarkable book about a formative, crucial time in American history. It not only synthesizes an amazing amount of information into a clear and compelling narrative, it also asks important ethical questions (about government, truth and lies, etc.) that kids and teens (and adults!) need to think about. So glad to see the comment from Unknown on Oct 24. Nimona absolutely blew me away -- I found it sui generis and utterly groundbreaking. I fear that saying WHY will spoil the story. But yes, it is super-LGBT positive, super-body/size-positive, and super-thoughtful about young women's RAGE. It fully utilizes the graphic novel medium; I find a lot of graphic novels well-intentioned but visually static. This, no way. Also it is sound on women in science, thoughtful about women in positions of corporate power, and very pointed about older women being underestimated and dismissed. One of the main characters has dark skin, but in context I'm not sure what race she's supposed to be. Well the main character in Simon is now a person of color there are several poc supporting characters.